The National Qualification Framework (NQF) is an instrument for mapping qualifications to one of eight levels. Institutions and ministries can submit a request for the mapping of a qualification for which they are responsible to the National Coordination Point (NCP). The template for a request for the mapping of a qualification can be found at Downloads. Within the request the applied level in reference to the respective descriptors must be explained as transparently as possible. The qualification has to be described in learning outcomes. 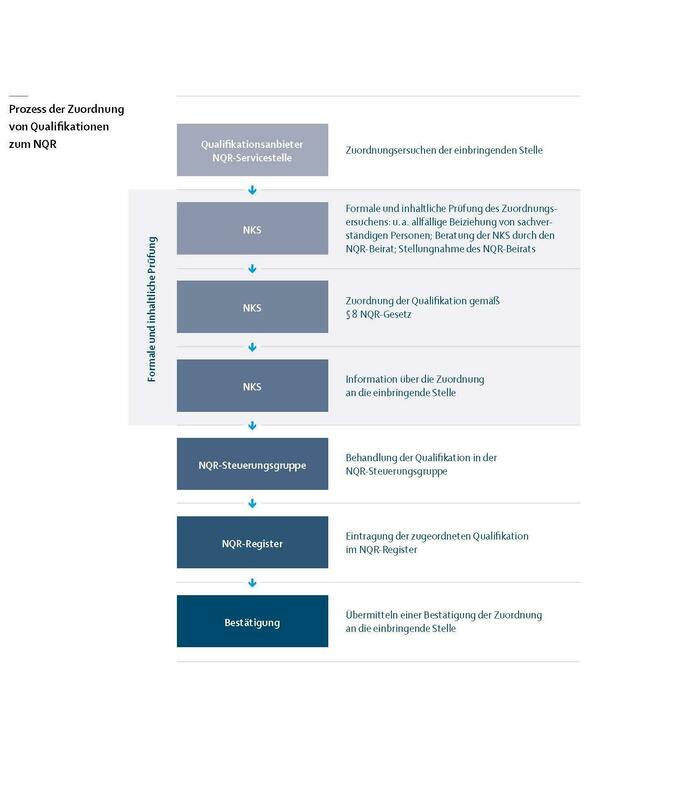 Basic principles for the mapping, formal requirements for organisations requesting the mapping of a qualification and further information can be found in the NQF-Manual. Once the request for the mapping of a qualification is submitted the NCP performs a formal and content-related verification. Within the verification the NCP can obtains expertise from external experts. In the next step the NCP collects a statement from the NQF-Advisory Board. Finally all relevant documents are sent to the NQF-Steering Group. The NQF-Steering Group can object to a mapping with a two-thirds majority. If not, the qualification is published in the NQF-Register and is officially applicable.